We’re good at forgetting, but we’re better at remembering. I’ve heard people say time changes us, but I can’t say I agree. I don’t really think it’s time that changes us – I think it’s us who change the time. We sometimes say we want things to never change. It comes mostly during the nights we stay up until 4 AM in the common areas of our living spaces talking about life – what’s happening now, what’s happening where we’re going, but especially, what’s happened where we’ve been. Because more than what can happen in the future, it’s our past that holds on tight. The end of the year is wrapping up quickly. It’s the end of my second year, and I have one more left to go. It’s difficult to believe that May 2016 will conclude my college journey. Although I’m over halfway done, I’m convinced that things are far from being over. I’ve been blessed with a season this spring that has been a time of build-up rather than breakdown, and when this season concludes, by God’s grace, I’ll be standing on top of a mountain that I’ve climbed for so long – and I’ll be completely in love with the view. It’s been a fight to get here, I think. College is a time to figure out who you are, sure, but I think it’s also a time to figure out who you’re not. 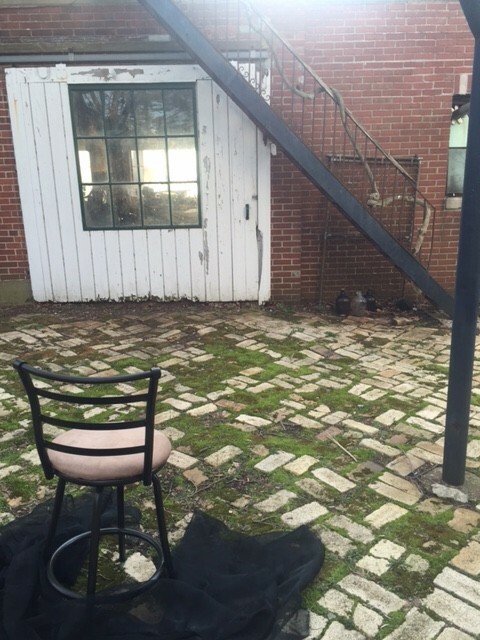 There’s a choice we all have to make: to sit back in the chair we’ve always sat in, or take a chance and climb the ladder. I look back at last summer and last fall, and I’m certain that I am no longer who I was. Sure, there are pieces that have tagged along with me. But I see life a lot differently now. I know new people, and think new thoughts, and create new words and phrases. I am hopeful that we all can say that – that we’ve changed, hopefully for the better, in one way or another. We have a tendency to let our past drag us down, I think. We base our future off of who we’ve been, convinced that there are certain patterns that will always take place. But have you ever considered the concept that our past, present, and future are all connected? Your present circumstances – your reactions, your words – have a direct relationship to where you have been and what you know to be true based upon the past. And your future circumstances – your perception of what is to come – is based solely on what you know to be true in the present, which is based on what you know from your past. There’s essentially minimal, if any, differentiation. And at any second, our perception of any one of them can shape our perception of all of them. We’re working with ambiguous clockwork. Define that, Sophie. Okay. Ambiguous is an adjective that means “open to multiple meanings,” and clockwork, well, it’s inner workings of a clock. It takes one thought, or the lack of one thought, to change everything. There are multiple interpretations of what our present moment contains, what our insides feel, and whether or not our perception even exists at all. Because one second, we’re in the present, and the next second, it becomes the past. Which brings us back to time. Have you ever noticed that we forget, we make the same mistake or discover the same joy all over again? That rediscovery is something that can change everything. I’m not saying that we should be better at forgetting. In fact, it’s often important to remember. But I’ve noticed that our future choices are too often dependent upon what we have seen in the past. We leave blank spaces in our expectations only for new experiences – but even then, we’re prone to infer. We’re all filling in the blanks for summer, even though it’s a new year, with new people, new places to find. We’ve had new experiences. Yet, we remember. We’re expecting some things to remain the same. The heat. Maybe the beach. Working, family, a break from school. But I’m hopeful and convinced mine is different. That this summer will be entirely different than any other year. My plan is to live like a little kid – with a sense of wonder, joy, and minimal expectation for the things that are yet to come. To not let my inner clockwork get messy by thinking there’s only one way to tick, but instead keeping in mind that I can remain open to different interpretations of the same circumstance. I want my time to be shaped by me, rather than me be shaped by time. As the school year is ending, my journey is just beginning. Follow me @hopesophie17 to keep up with me this summer! Questions or comments? Post below or sen me an email at sophie.guetzko@hope.edu. Alrighty folks, I’m back again with another post. Great right? So here is my “thesis” of this blog. Although college has a large focus on academics, it is OK to be social. I felt as if I was writing a formal paper there for a sec. Anyways, yes. As a nursing major, I am completely buried in homework and study literally 24/7. It can get irritating, but it’s the life I chose, and it’s my calling. So secretly, I enjoy this work sometimes (weird, I know). But last weekend, I did a lot of homework so I had time to just relax this week. But, I also was social and hung out with my friends! Ultimately, you have to find that balance between academia and the social realm, which is pretty unique here at Hope. So, my homework is already done for this week. It is SO nice to have this work done. I have had so much time to focus on relaxing and working on SAC stuff. I’m a project lead for the annual Chicago Trip, so that is stressful. Just imagine schoolwork on top of that… it would be a disaster!! Regardless, maybe I’ll do this more often, the doing my work ahead of time because i have so much time for myself now! But along with the completion of my work, I found time to be with some of my best buddies. It is good to have this time in college because it maintains your sanity. Trust me. Anyways, it was fellow blogger’s Chelsea Barfield‘s 22nd birthday, and my friend Nate’s 21st. So, we went over to his house to enjoy each other’s presence. We played trivia about each other, and all I have to say to that is we learn something new everyday, HAHA! 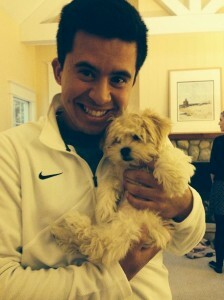 Along with having fun at the birthday party, I met Chelsea’s precious puppy, Maizey Jane. She DEFINITELY wins the cutest puppy award. This is the kind of dog I want when I get out college. Something cute, cuddly, and fun. Something Maizey! Afterwards, I ended up watching Despicable Me 2 with one of my best buddies, Joey. Oh man did I laugh a lot. Another thing I wish I could have are Minions. They’re simply the best. That following Saturday, I did some homework, worked out, and hung out with my friend Hannah! We watched 21 and Over and Pitch Perfect. It was a nice way to unwind. She also took me grocery shopping, and I bought a box of clementines. By the time we finished our movie, I ate 8. Yes, 8. They are the best. Then, that Sunday, I slept in a little bit, had breakfast with Joey, did some homework with Hannah and Allie, ate dinner, then watched my favorite TV Show, Revenge. If you haven’t seen it, GO. It’s on Netflix. It’s full of mystery and suspense, and in the perfect combination. Ultimately, I had a productive weekend. Because I had those intervals in which I hung out with my friends, I got a lot done! See, everyone has 24 hours in a day, we just spend it differently. That’s it for now! If you haven’t already, FOLLOW ME on TWITTER! Just shoot me questions if you have any! I’ll be posting again later this week! Well… not really… but it seems like it an awful lot of the time lately. Since I left Hope in May, my life has revolved around politics. All summer, I worked at a free/low-income health clinic in Traverse City. With the health reform bill coming quickly, a lot of changes were going to have to be made at the clinic. No longer would any services be able to be “free,” as the organization that was usually paying for treatment, CHAP, could no longer exist without government funding. Not only did this spark many policy debates within the clinic, but it pushed me to stay informed. The clinic, the place I had come to love, would have to do a 180-degree change to keep serving the public and provide the resources it does while trying to maintain the staff levels they had managed to keep through the last budget cuts. Would Obama-care pass? Could it stay in place if Obama was no longer in office? 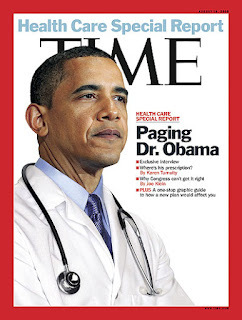 What would Romney [attempt to] do to change the healthcare reform? More recently, I’ve been proactive with both political parties. This fall I’m taking a half-semester class called Democratic Elections. We have been studying democratic campaigns and their structure and strategies. 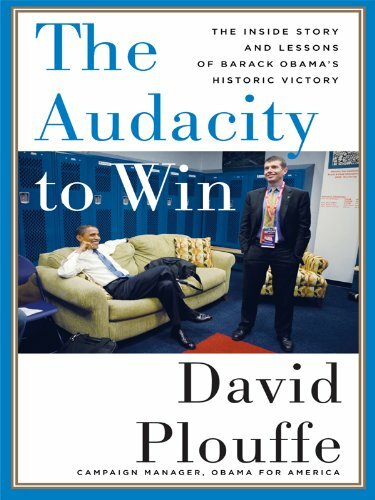 I’ve been paging my way through The Audacity to Win by David Plouffe, Obama’s 2008 campaign manager. Through the course, we are required to do 16 hours of political volunteer work with the democratic party. Most of my work has been done at the Ottawa Democratic Headquarters here in Holland. But when I go back to political roots, I identify most with the Republican party and, in the past, have done most of my political work with them. My high school friend, Marvin, is on the executive committee of Hope Republicans, so I HAD to check it out. One of the first events I attended was visiting the Mitt Romney tour bus. He’s got a lot of swag! See my pictures below! So, who the heck am I going to vote for? I guess I still have a lot of policy reading and deciding to do.